We all love to get outside and play however the weather is often against us, and while the kids do love jumping in puddles and playing in the rain there are times when we need to make other plans to entertain the children. There are so many activities which are be done outside that there is not always a need to turn to screens to entertain the children. They can learn new skills, play games, and try a new craft. It’s fun to learn a new dance or a workout routine. Wear your favorite pair of dancing shoes and move to the beat. Getting your body grooving is a great way to get some muscle toning and cardio. You don’t need to worry about sweating as you can stay cool indoors. Why not have a dance off, pop on some music and dance around the kitchen. Or you could find some Just dance routines on YouTube and go head to head – the kids love doing this with me finding the hardest ones for me to try. Give a new life to your plain old shirts and paint them with different designs, we use sharpies which work very well. You can also make stained glass windows by cutting out different shapes from cellophane, paint your own canvas or even create some masterpieces by junk modelling with all the recycling sitting in the kitchen. There are many colourful possibilities to release your inner artist. Did you know that you can make your own slime at home? It’s safe, even for small children. There are some slime recipes that use Elmer’s glue while there are edible ones that use Nutella. Whatever slime recipe you want to get your hands on, creating your own slime can keep anyone entertained indoors for hours. Add some mini toys into the mixture and play a “what is it?” game by blindly feeling the objects. Go camping indoors. You can even cook s’mores and eat your meals off paper plates and drinks from a canteen, to give you the feeling that you’re in the middle of the forest. Set up a tent in the front room if you have room or just get the sleeping bags out for a downstairs sleepover. We do this most Friday’s and team it with a movie night. The kids love sleeping downstairs. Make your own fun recipe with your kids. Designate some manageable tasks and let the kids cook and clean by themselves. Cooking and doing other tasks in the kitchen can be such fun, even for small kids, if you work together. This teaches them the value of doing household chores, too. Mine both love preparing the vegetables with me, cutting them with supervision and they also like to add the ingredients during the cooking and stir the dishes. I also find that the kids will eat more if they have prepared meals themselves, this is a recipe for a leftover chicken curry which Emmy made herself. Are the grandparents, Aunts, Uncles far away? Let the kids send them a letter – through the mail (that’s still a thing, right?). Let them use crayons, pencils, pens, and paper. Address the letters to your loved ones and mail them. This will be a nice and personalised surprise for anyone. Or if your friends have children, perhaps they could be penpals – draw each other pictures, ask questions to be answers – who doesn’t love receiving letters in the post, well except for bills obviously. Let your creativity soar. You can transform the whole living room or bedroom into a huge castle by building a fort made with pillows and blankets. You can also create a secret hideout and let your kids play spies Kids can also make their own puppets and tell a story with them, or use a lamp and make shadow puppets on the wall. Have a teddy bears picnic or get the kids soft toys and play vets. 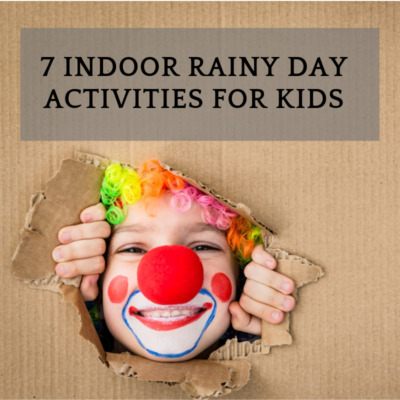 There are a lot of indoor activities that will provide hours after hours of fun. All you have to do is to find which activities are best for you!